Dance festival season is upon us. It’s a time of year that has dancers practising their combos under their desks at school, costume coordinators working day in and day out making their volunteer position feel more like a full-time job, and instructors and choreographers feeling excited and nervous and stressed and proud and tired and energized — just so many feelings. One of the groups I teach performed at the Manitoba Ukrainian Dance Festival, hosted by Troyanda Ukrainian Dance Ensemble, in March. I attended the festival’s instructors’ workshop, led by the adjudicators Shannon Gabrush and Maksym Zabutnyy. We focused on tips for instructing the youngest dancers in a school and how to teach boys tricks, even if you can’t do them perfectly yourself. It was an inspiring morning. I was excited to apply what I learned to my own classes, and I was excited to see how Ukrainian dance skill and pride in Canada will continue to grow thanks to people like those who attended and led the workshop. Dance festival season has me thinking back to the days when I competed. I loved (and still love) performing, and I especially loved dance festivals. Yes, I got nervous before heading out on stage (which holds true today, too), but I was mostly excited to be surrounded by friends — those I practised with every week and those from other dance schools who I saw only at competitions — and to do a thing I so dearly loved. Plus, I loved the whole festival atmosphere — staying in hotels if it was out of town, getting to pack my a giant lunch kit full of my favourite foods or, better yet, going out for a meal or two. Dance wasn’t like the other extra-curriculars I was in — no matter how often I practised or performed, I never got tired of dance. I loved how you put so much work leading up to performances that when it got to competition time, you gave it your all and that was the best you could do. In volleyball and other sports I played, you were up against another team, and no matter how hard you trained, the final result also depended on how the other team played. But in dance, your outcome depends on you and your fellow dancers. Besides reflecting on my own competition days, dance festival season also has me thinking back to my time in Ukraine, training with professional ensembles. Throughout the year, I kept a journal, writing about things in and out of the studio. Along the way, I’d make notes about rehearsals that stood out to me or funny/surprising/entertaining things that happened. And eventually, I had a bit of a “best of” list, some on paper and some in my head. The Poltava ensemble also had the best set up of rehearsals, in my opinion. It was very structured, and the group stuck to the schedule: 45 minutes of ballet, break, 45 minutes of technique, break, 45 minutes of choreography, and then we’d be done for the day. Sometimes after choreo, we would have another break and dance for a little longer. We spent hours and hours at the Poltava Philharmonic rehearsing with the ensemble. The building was going through renovations when we were there — I can’t wait to see the building when it’s complete! So we started learning dances — ones Pan Vadim said we were going to perform with the ensemble — that very first rehearsal. He even gave us homework. Besides having to learn the dance, we also had to learn the verse the ladies sing in the dance. And Vadim made sure we would, even asking our language instructor to incorporate practising it in our lessons. Волинський народний хор, the Volyn song and dance ensemble. The first dance we learned with the ensemble was Перший номер (first number). 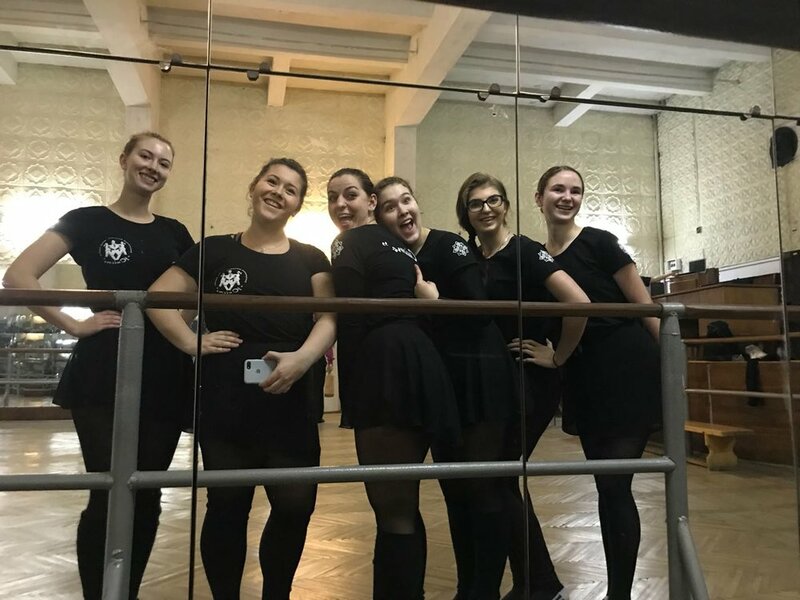 The ensemble had many performances while we were in Lutsk, and so although we learned lots from them — some of the dancers would work with us during their breaks — we didn’t have a chance to dance with the full choir and orchestra. We’d just do the dance at the back or watch at the front while the ensemble dancers prepared for their show. A screenshot from a video of me and my all-star partner Oleksi rehearsing the dance we performed at my last rehearsal with the Volyn ensemble. But that changed on our last rehearsal with the ensemble. Oleksandr Stadnyk, the director of the entire ensemble, and Valeriy Smyrnov, the artistic director of the dancers, had us step in to do Перший номер along with the choir, orchestra, and ensemble dancers, people who treated us like family and who continue to inspire us today. There was an energy in the room like I hadn’t experienced before. I’ve had many memorable performances — in Canada, across Eastern Europe, and multiple shows in Ukraine — but nothing compared to how I felt that day. Even though there wasn’t an auditorium full of spectators watching on, we could feel the beaming faces of the other dancers watching from the side, the singers tearing up as we pointed, flexed, and spun, the orchestra peaking from behind the choir to catch a glimpse, and the artistic team standing at the front of the studio, with Ukrainian pride in their eyes. It felt like the entire country was watching us through the great big windows at the front of the studio. After the performance and a couple speeches, the entire ensemble sang Mnohaya lita to us. Just thinking back to that moment, a feeling of love and pride rises up in my chest. Yunist Honoured Ukrainian Dance Ensemble. We just got back from driving to and from Poland — we left at midnight one day, drove, went to the visa office, hung out while our applications were processed, went back to get our visas, and eventually headed back to Lviv, where we arrived around 2 am. That day we moved into our apartments, located our dance clothes somewhere in our belongings, ate way too many varenyky, then headed to our first rehearsal with Yunist. Since it was our first class with the group, we thought it would be more of an introduction. Maybe we’d just watch to see how the class was run. I wore a long-sleeve bodysuit, thinking we’d take it easy. Oh, how I was wrong. This was our first time experiencing the famous (I’d say infamous, except we learned to love it) Yunist warm-up. We did cardio and dynamic stretching in a circle, alternating between the two. We transitioned into dance steps, still in a circle, then a couple basic combos of stamps we’d do every week. OK, this doesn’t sound like that much, but let me tell you, it went on and on and on. Though we were sad during our final rehearsal with Yunist, we were still all smiles and full of pride because of how far we had come since that nearly puke-inducing first rehearsal. Next we’d go to our spots at the barre. But it wasn’t time for the ballet barre exercises yet. We did some limbering, kind of like your typical barre exercises (pliés, tendus, and so on) but with more of an emphasis on working slowly through positions to make sure everything is warm and loose before you start the true barre. This led to some flexibility and strengthening exercises, including a lot of ab work. The most important part of this entire warm-up was to make sure you didn’t catch a glimpse of yourself in the mirror, because there’s nothing more unmotivating than seeing how awkward and weak you look next to these strong dancers ten years your junior — or maybe that’s encouraging for you. But not for this divchyna. It was after this that we’d finally start the ballet barre, followed by exercises in the centre (like jumps) and technique. My muscles would shake, nearly giving out, but I knew it meant I was growing stronger. Still, after that first rehearsal, when I was running on little sleep, just moved to a new city, ate a pot of varenyky, and dressed way too warmly for the very humid studio, I didn’t know if I would make it through. But I did. And soon, the Yunist warm-up was something to look forward to, even if it made you feel like throwing up and fainting. Nevertheless, after two months in Lviv, my cardio was the best it had ever been. Volyn. When I arrived in Lutsk, I was not a ballerina. By the end of the two months, I still wasn’t a ballerina. But at least I knew what a brisé was. And that’s how the first good few weeks went. But I am confident in saying Lutsk, the home city of the Volyn ensemble, was where we all improved the most. Though the ballet barre and centre exercises were complicated and difficult, it was the push we needed. Some of us would go to the studio — my favourite studio we trained in, with its giant windows letting in the spring sunlight — early before practice to run through exercises so we could, well, flail a little less. Or at least feel like we were flailing less. We would arrive early to class to practise Volyn’s fancy footwork (and to have photo shoots with our cool leggings). The dancers were also more than willing to work through the steps with us, and goodness, did they ever have patience. Dance is such a body and mind thing. You can totally understand how to do a step, but when you try to do it, your body just can’t. And that was often the case in Lutsk. I’d understand the corrections the dancers were giving, but sometimes that mind-body link just wasn’t there. But the dancers never gave up with us. They’d walk us through steps. They’d take us by the hand. They’d stay after class or miss their breaks during rehearsal. And eventually, the body started to do what the mind told it to, not necessarily as well as the other dancers, but at least we did it. It’s amazing to watch videos of us from before Lutsk and compare them to after. All of a sudden our chaînés turns were rapid fire, our legs had never lifted so high, and our feet had never moved so quickly. The dedication to a challenging ballet class shows in the skill of the Volyn ensemble. The way the dancers hold their bodies, their strong-yet-delicate moves that make everything look easy (until you attempt it), and their манера (manera, meaning manner/character/style) that draws you in. Virsky. Within the first couple days of training with the Virsky studio group (dancers who are preparing to audition for the company), the dancers told us about the stretch class, something we would both dread and love. Every Saturday, instead of doing centre work after barre, we did a stretch class. The dancers would put on their sweats or “garbage pants” (to make sure their tights wouldn’t rip from the rough floor) and spread out throughout the room. The ballet master, Alexandre Donets, would put on music and talk us through the stretch. He always played the same song, and throughout our time in Ukraine, we’d randomly hear it playing somewhere, giving us flashbacks to having to hold splits for five minutes each way. Note: This is not at all what we did during stretch class. This was my first city of intense dance training, so I was still working on my strength and flexibility. I did get more flexible, thanks to Virsky’s stretch class, but I think had I done this at the end, when I was in even better shape, I would have gotten more out of it. Because sometimes, I think we overdid it so had to take it easy once in a while. But I do think a stretch class is a great idea for ensembles, and though groups in Canada don’t practice six days per week like Virsky, even a class once in a while to get dancers in the habit of it, plus to give them a stretching routine, would be super beneficial to improve skill and reduce injury. I’d also like to mention another “The Best ___” from Virsky: “The Best Character Class.” Valery Shkorinenko led class. He’s also involved with the G. Veryovka Ukrainian National Honoured Academic Folk Choir that practices in another studio in the same building as Virsky. My sweet, sweet friend Eva — if I were only a quarter as talented as she is, I would be ecstatic. I’ve done character classes before, but mostly Ukrainian character classes that focus on steps particular to the various regions in Ukraine. The class at Virsky focused on folk dance in general, so Spanish, Russian, Polish, Georgian, and so on. When learning a new exercise, the instructor would show it full out at full speed. He was amazing. He’s such an unassuming-looking guy, then next thing you know he’s doing these incredibly difficult steps with a smile on his face and lit-up eyes. After he showed the exercise once, he’d break it down, first going over feet, then adding in hands and arms. We’d spend lots of time on something, not rushing, to make sure everyone got it. For example, to master those soft and precise Spanish wrists, we’d stand with our arms outstretched and roll our wrists about 500 times per class, as he would say “medlenno, medlenno, myagko, myagko” (slowly, slowly, softly, softly in Russian). Whenever he did a new exercise full out for us, I remember thinking, I’m never going to get this. And then, next thing you know, after breaking it down and going through it step by step, movement by movement, I got it! His attitude and respect toward his students, and that of the students toward him, was inspiring and something I constantly work toward with my own dance students. Having trouble with a step? Do the step over and over while holding the hand of someone who knows it well, preferably Leonid Sydorchuk, artistic director of the Bukovyna State Ensemble. The Bukovyna regional dances feature fast, intricate stamping combinations. While in Chernivtsi with the ensemble, we tried to learn at the back and from videos as best as we could, but there were often nuances we needed clarification on. And so, Leonid was generous with his time, holding extra rehearsals with us when the ensemble had performances or taking time out of his break during rehearsal to work with us. Thanks to Leonid (back centre), my feet stamped in ways I didn’t even know was possible. But still, sometimes no matter how many times he would break it down, there were those combinations that for whatever reason just wouldn’t click. Leonid didn’t make a big deal about it if one of us didn’t get the step. He would just walk up to us, hold our hand, and count us all in to do the combination again. It was as if a surge of talent travelled from his body to ours, like the one brain cell responsible for our learning of the step — the brain cell that was lacking — transferred over. The frustration, nervousness, stress, excitement, embarrassment, gratitude, awe, passion, and pure joy combined and gave us that extra push we needed to do the combination. Yunist. My very first time performing in Ukraine was with Troyanda at the International Ukrainian Dance and Culture Festival in Lviv in August 2017, a month before I started my year-long journey. That was incredibly special, doing what I absolutely love — dancing — with my dance family in the country of my ancestors. That November, I had my first performance with an ensemble from Ukraine, Yunist, also at a show in Lviv. My new red boots made their debut, too! My sister was visiting me but unfortunately left back to Canada only one day before the show. But she did get to watch us rehearse, including the practice when we were cast in the show… three days before the performance. I was put in Hopak, the final dance of the show, which was great, except I had been focusing on learning another dance that we were under the impression we’d be in. But that’s how dance is, so for the next few days I practiced at home, in the studio, and in my head before going to sleep. And then, on November 19, 2017, us Canadians, Ensemble Kukurudzy, if you will (which you may remember from my Poltava post means “corn”), made our Ukrainian debut. This was our first of two shows with Yunist, and our first of a few with other groups in Ukraine — twice in Chernivtsi, and that magical final day in Poltava, where we performed alongside the ensemble’s men in Kozachok in front of others on the Cobblestone Freeway Tours Ukrainian Dance Workshop Tour. Hannah and I living the dream, performing Ukrainian dance with a dance group from Ukraine while in Ukraine. Just like the performance with Yunist was the best first performance in Ukraine, the show with Poltava was the best last performance (as were the other performances the best middle performances). At that show in Poltava, we were called up on stage before we performed and were presented with newspapers that we were featured in — a reporter came to talk to us at the studio one day. And after we performed, we were called back to the stage and presented with an entire ceramic pot of the Poltava regional delight halushky, dumplings that are kind of like varenyky but without filling. Virsky. During technique class with Virsky, one across-the-floor combo we did was four chaînés then two balances, all over the left. After everyone went across, the technique instructor would go person by person to give corrections and comments. Well, one day, he addressed the dancers as a whole, frustrated they still couldn’t get the timing. “Even the Canadians can do it!” he said. We will take that as a compliment. Sort of. Buko. Our last rehearsal with the Buko ensemble also happened to be my birthday, February 23. The group was running through their dances, but some people were missing, more than usual. We would often get called up to run through dances we’ve worked on with the instructor, and on this snowy day in February, he put us in quite a few, some of which we barely knew. The dancers pulled us around, yelled out the next dance step, and pushed us where we needed to go. It was challenging. It was invigorating. It was terrifying. It was great. I have a couple videos from that day, showing the dancers tossing me around. And you know what? I don’t look as bad as I felt, only because the other dancers knew what they were doing, and then some. Dancing is such a team effort. Everyone needs to know their spot, to know the spot of the person beside them, and to be confident, so that when an ill-prepared Canadian, like me, is thrown in a dance, she can (not quite but almost) seamlessly slip in to the dance, blending in with the rest. Pan Poltava. In many dance instructors I’ve trained with, I notice this quirkiness about them. They can seem super composed and strict one second then the next second they’re making some unexpected joke or coming up with some analogy that has you thinking, where did they come up with that?! The creative mind is a beautiful thing. This was how Pan Poltava was. One practice, we worked on our bow, over and over and over. We had to clarify when to take a slight breath, when to put our hand to our beads around our neck, when to bend, the angle of our bend, when to come up, and so on. I guess the first time we ran through the dance that day and did the bow, we didn’t look so great. Because Pan Poltava went into this elaborate description of how it looked as if we were children performing for our mom, who was in the audience and cheering loudly for us, and there we were on stage looking like we wanted to go off as soon as possible because we were about to throw up. I think the point to this analogy was that people in the audience won’t always be like our mothers who cheer for us no matter what, no matter how we look. This is important throughout the entire dance, but especially the end since it’s the last time the audience sees you. This was just one of many analogies he gave us, and perhaps a bit less “out there” then some of his others, but nonetheless it got the point across. My friend Hannah, who adjudicated her VERY FIRST DANCE FESTIVAL!!! the other weekend, reminded me of how it took nearly two months for Pan Poltava to say молодці (well done) to us. He made you work for compliments, as it should be. And though sometimes his critiques were harsh, including some of his analogies that described us as not exactly the beautiful dancers we strived to be, it was even more incentive to work hard to earn his “approval,” or whatever you want to call it. And, just so you know, when we ran through one of the dances for the first time with the full choir and orchestra, our performance brought him to tears, not because we were so incapable, as we at times felt, but because we took his corrections to heart and our dedication — and pride — showed. ALL, of course. Those we worked with, those we watched, those we didn’t work with, those we didn’t watch — if you’re part of a Ukrainian dance group, anywhere in the world, preserving the country’s culture and traditions, celebrating the people and their customs, and performing to share your love for this beautiful art, then YOU are part of the best Ukrainian dance ensemble out there. Everyone. We met people of all ages, some who had families, some who worked multiple jobs, some who went to school full time. We talked politics, family, Ukraine, culture, dance, Canada. And because of this — because of you, Ukraine — I left the country feeling more inspired than ever and excited for when our paths cross again. To all the dancers, adjudicators, instructors, choreographers, volunteers, and families as we make our way through this busy time of year (festivals! recitals! fundraisers! ): You are doing a beautiful thing that you should be proud of. I know I am. We were clearly very sad to have our final rehearsal of studying dance in Ukraine. But we knew it also meant that we had something to look forward to — visiting our friends in Ukraine for a polka or two and meeting others in Canada who are just as passionate as we are about celebrating Ukrainian dance and culture.